High Dose InterLeukin & Stable Disease–Not just for horses anymore! There was a time that I might have thought that Stable Disease was just for horses. But I have come to learn that “Stable Disease” just might be more popular than ever. Long term STABILITY with HD IL2 is a subject that is newly being examined, and may confer a ‘clinical benefit’ to a patient. We patients do like getting benefits from medicine. Let me explain. As a long term & complete responder to IL2, (over ten years), I am nevertheless frustrated that too few patients get complete data on its use. Too few ever learn if they might be candidates to try such a treatment. It is the only treatment to date which can be curative, though few patients ever hear its complete story. We patients are best served when we have all the data presented to us in a balanced way, so as to make treatment choices more objectively. Unfortunately, too many doctors fail to consider HD IL2 for metastatic RCC patients, most often due to their own inexperience with IL2, and its reputation for being a tough treatment to tolerate. I am alive today only because I had HD IL2, and thus, take a special interest in helping others understand it better. High dose interleukin2 (HD IL2) must be viewed in the context in which it was approved, with the trials that led to its approval. This approval reflects the real limitations of treatment at that time, the desperation of very sick patients, and their willingness to attempt a treatment early in its stages of development. HD IL2 was approved in 1992, and other than surgery, it was the only real option. Metastatic RCC had a grim prognosis, with about 80-100% 5-year mortality rate. Trials were held in 21 institutions, in seven Phase II trials. Not every patient had a mastectomy or removal of the tumor and/or kidney. Patients were aged 18 to 71. The very young patients most likely did not have clear cell RCC, which has been shown to the variant most responsive to IL2. No doubt other non-clear cell patients were included, which may have depressed response rates, as is now understood. The approval was based on the Overall Response Rate (ORR), broken into Complete Response(CR) at 5+% and Partial Response (PR) at 9%. The PR response duration was 19 months, at which there was Progression Free Survival (PFS)–half of those with PR had long PFS, and half had shorter PFS. They could not measure the PFS of the CR patients, as there were patients who lived beyond the period of study.The hope was apparently to provide at least one year of PFS, which was clearly met. 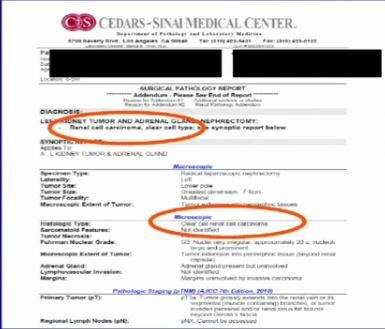 CRs were defined as complete disappearance of all tumors, measured twice, more than four weeks apart. Frankly, that reflects pretty pessimistic expectations, so that those CR patients could not reach a median was terrific. Essentially some patients outlived the length of the study, and in fact, some lived more than a decade. PRs had to show a 50% or greater reduction in measurable tumor area, with NO increases anywhere, and again, measured twice, four weeks apart. Some PRs had shrinkage of 90%–that was still a PR. Those with 30% shrinkage were not considered to have had a PR, though a 30% shrinkage in newer meds is typically considered a PR. versus progression at any time. An abstract in ASCO2014 reviewed HD IL2 as to this CB, which was defined as Complete Response, Partial Response and Stable Disease. With that nearly HALF of all patients had Clinical Benefit. A CR was found in 11% of patients, PR in 6%, and Stable Disease in 45%. Others were not able to evaluated or lost in the follow up. Look at all trial stats to really understand what the responses have been, what those definitions are, and the fullest picture of what can happen. Not usually an apples and oranges thing, but valuable to all of us. The paradigm we should be evolving to is a paradigm where patients with different tumors should be treated with different drugs. (Right half of slide shows Drugs A and B going to different subsets of patients.) 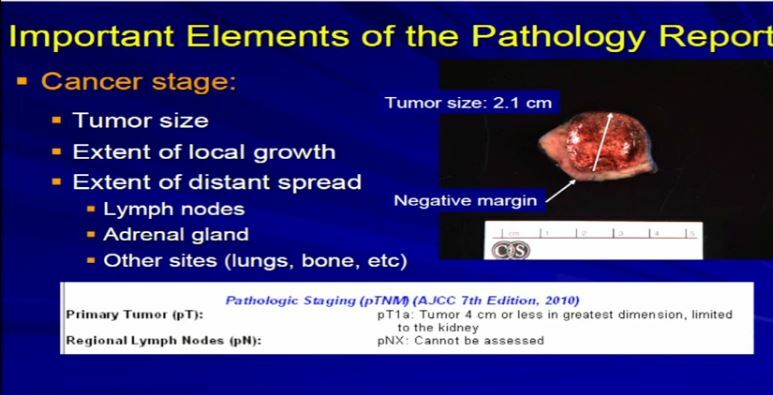 In the context of renal neoplasms , as you are well aware, we have kidney cancer with clear-cell carcinoma which accounts for the vast majority (75%) of that, and that’s going to be the focus of the first part of the talk. The work from the Sanger Institute by Andy Futeral and Michael Stratton led to the identification of mutations in the polybromo1 gene. Polybromo1, like VHL, the most commonly mutated gene in clear cell renal cell carcinoma, is a two-hit tumor suppressor gene. That means both copies are mutated in tumors. They identified through truncating mutations in approximately 41% of clear-cell RCC. PolyBromo1 encodes BAF 180, which is a component of a nucleosome modeling complex which may regulate, among other processes, transcription. Work from my laboratory led to the discovery of another gene mutated in RCC, the BAP1gene. Like the BPRM1 and VHL, BAP1 is a two-hit tumor suppressor gene, but it is mutated in only about 15% of sporadic clear-cell RCCs. This work was done focusing on tumors that were of high grade. Indeed, we found there was a correlation between BAP1 loss and high grade, and also activation of the mTOR1 pathway. BAP1 encodes a nuclear deubiquitinase. 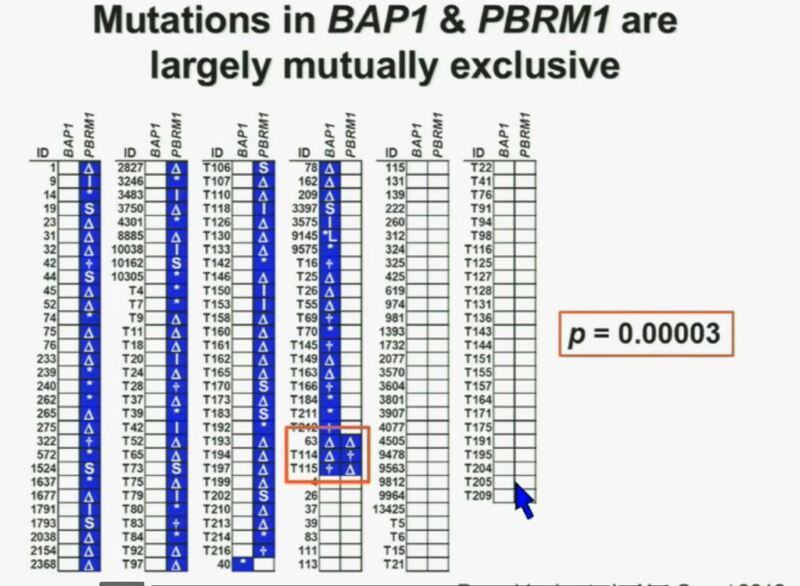 Of greatest interest, mutations in BAP1 and BPMR1, we found, are largely mutually exclusive. 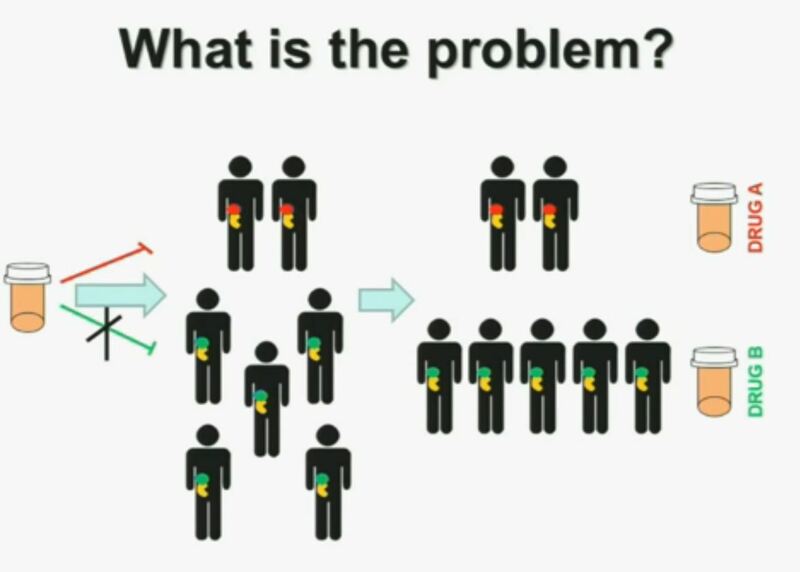 This is shown this more detailed the next slide. What you are seeing here are 176 tumors, each in a row. These are tumors that have a deletion in PBMR1, these are tumors with the insertion, this with a point mutation (referencing the various symbolsP. All the tumors in blue are tumors that have a mutation. 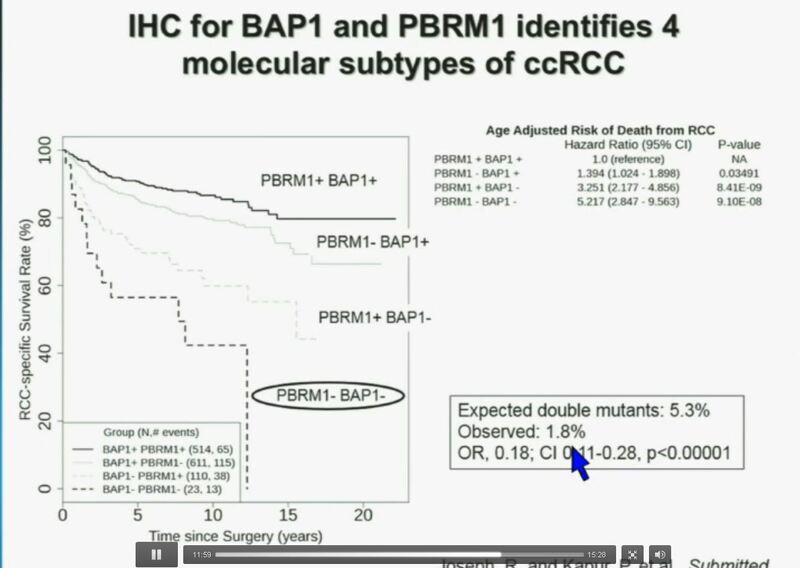 As you can see most of the tumors, we see with PBRM1 mutations do not have mutations in BAP1. (in last column) Here you have some tumors with mutations in BAP1, and we only identified three tumors that had mutations in both genes. The probability of having mutations in both genes was statistically significant. Based on the individual mutation probability, we would have expected 13 tumors to have both genes. Only three were found, suggesting that BAP1 and BPRM1 mutations are largely mutually exclusive. We went on to performing a meta-analysis. This is looking at data from that Beijing Genome Institute, at Memorial Sloan-Kettering and this from the TCGA (The Cancer Genome Atlas). 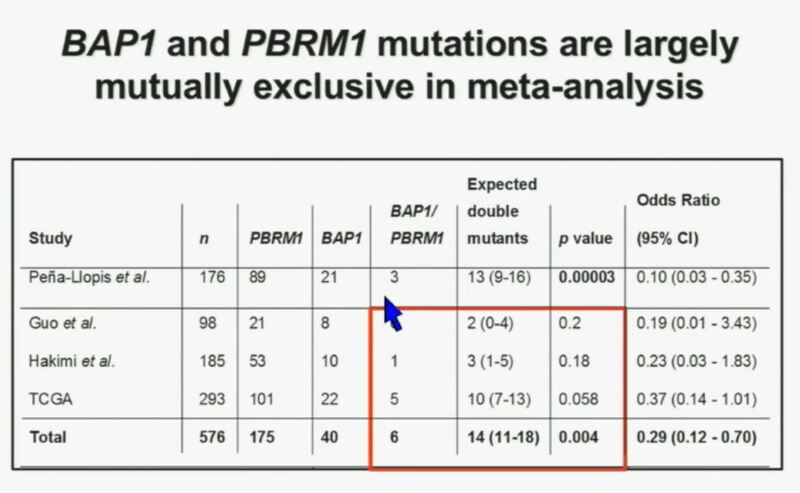 As you can see, even though the numbers are small, the numbers of tumors with mutations in both BAP1 and PBRM1 was reduced, compared to the expected number of tumors based on the individual mutation frequency, and the p value was statistically significant. 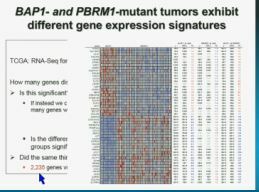 I’m going to go through these and not spend much time, but suffice it to say that that we found that these tumors that have had mutations in BAP1 have a characteristic gene expression signature, and the tumors that have mutations in PBRM1 also have a characteristic gene expression signature. 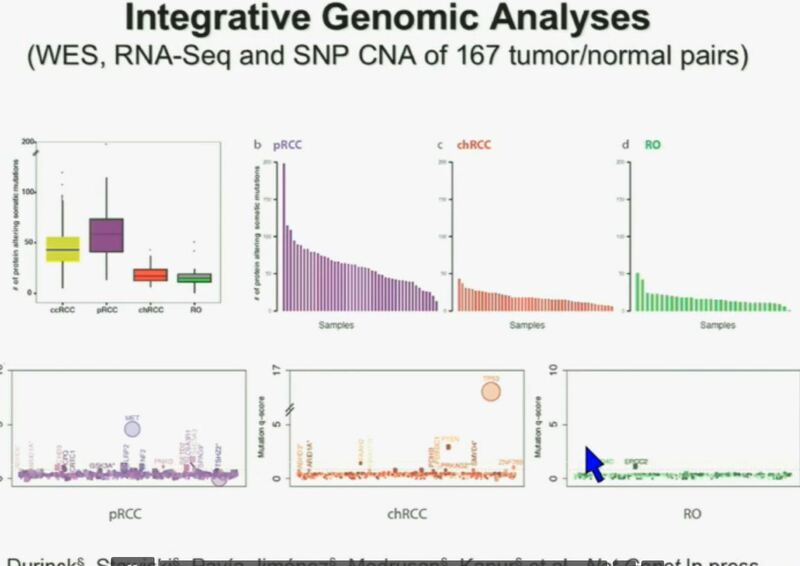 These gene expression signatures do not overlap. 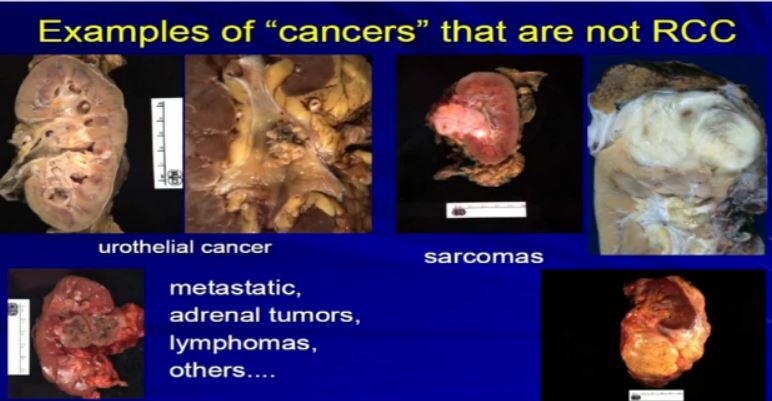 These are tumors that have different gene expression patterns and different biology. 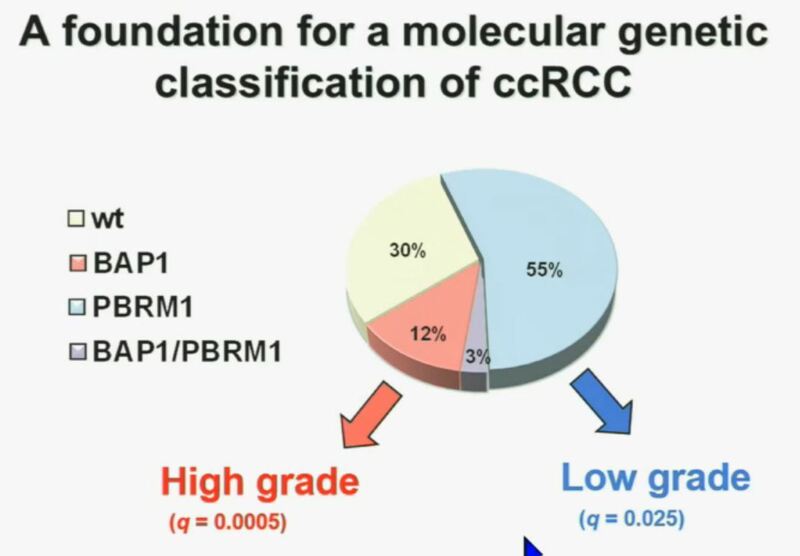 We think this establishes a foundation for the first molecular genetic classification clear-cell RCC. 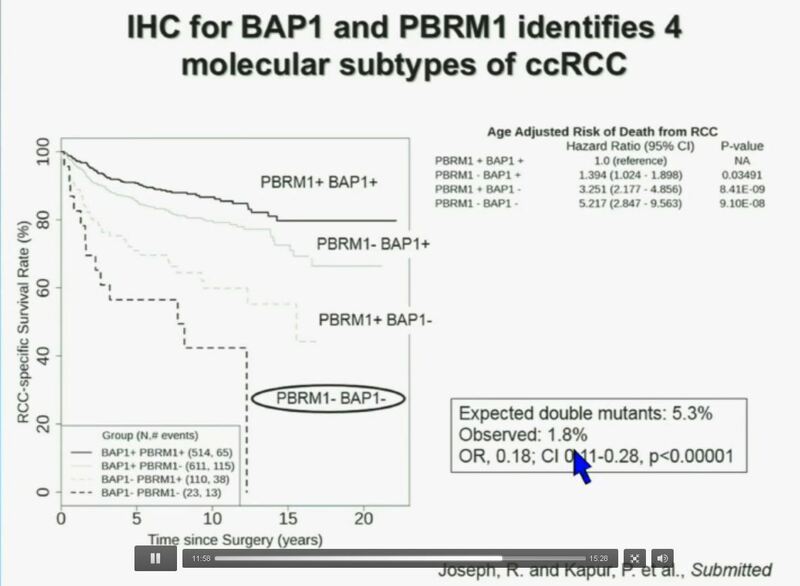 In our series, 55% have mutations in PBRM1, and 15% of the tumors have BAP1, and including 3% have mutations in both. We also observed that there is a statistically significant correlation between mutations in BAP1 and high grade, and mutations in PBRM1 in low-grade. So that let us to propose the following model. 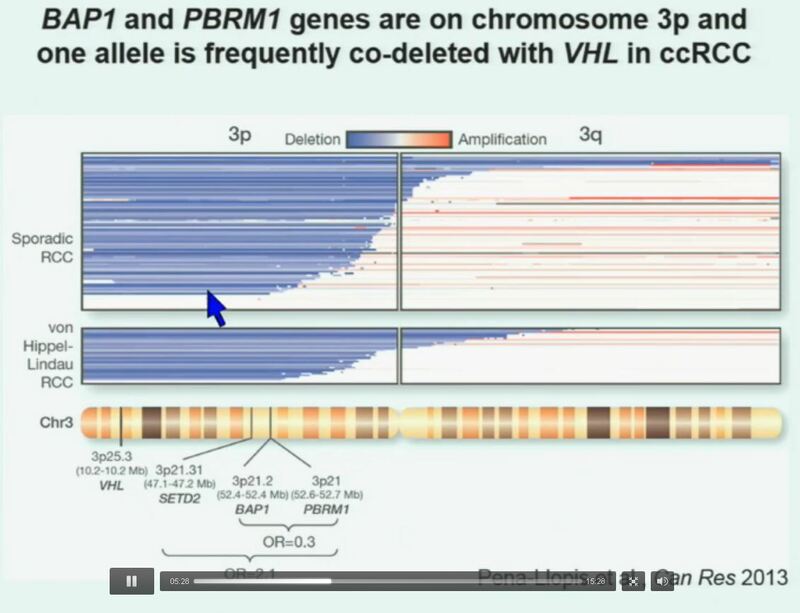 This is a model based on the fact that, very interestingly, VHL, BAP1, and PBRM1 are all located on chromosome 3. In fact, the short-arm of chromosome 3, and this is an area that is deleted in the majority of patients with von Hippel-Lindau-associated renal cell carcinoma, as well as in the majority of sporadic renal cell carcinoma, depicted here in blue. You can imagine that with a single deletion, the kidney cell is losing, in fact, four copies or one copy of these four different tumor suppressor genes, the BAP1, PBRM1 and VHL. We have proposed the following model. We believe that renal cell carcinoma, and this is consistent with data from Gerlinger and colleagues, that it begins with an intergenic mutation in the VHL gene. And this is followed by loss of 3p, with a concomitant loss of one copy of all of these tumor suppressor genes. 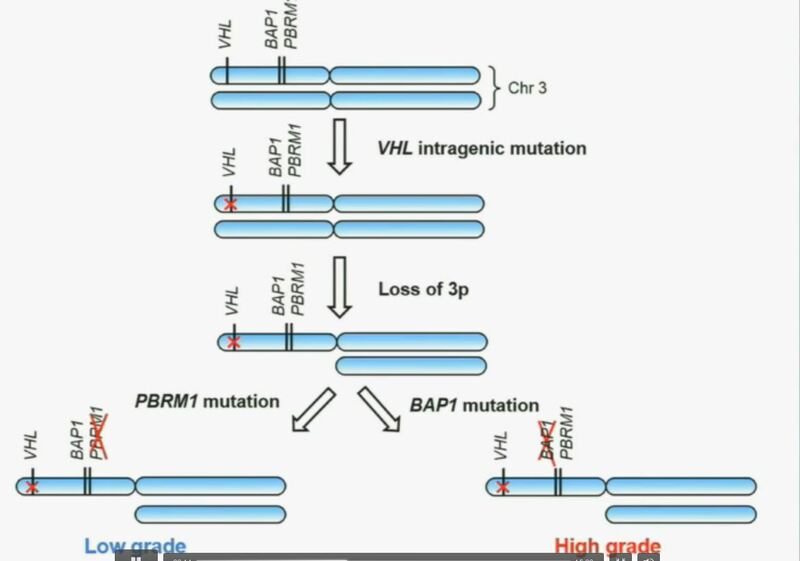 We then think that a mutation in PBRM1 leads to the loss of PBRM1 function, which is a two-hit tumor suppressor gene and low-grade tumors, whereas the mutation in BAP1 is associated with the development of high grade tumors. This model also predicts that patients with BAP1 and PBRM1 deficient tumors may have different outcomes. So we simply took those patients whose tumors we had analyzed and asked what happens to their outcomes. 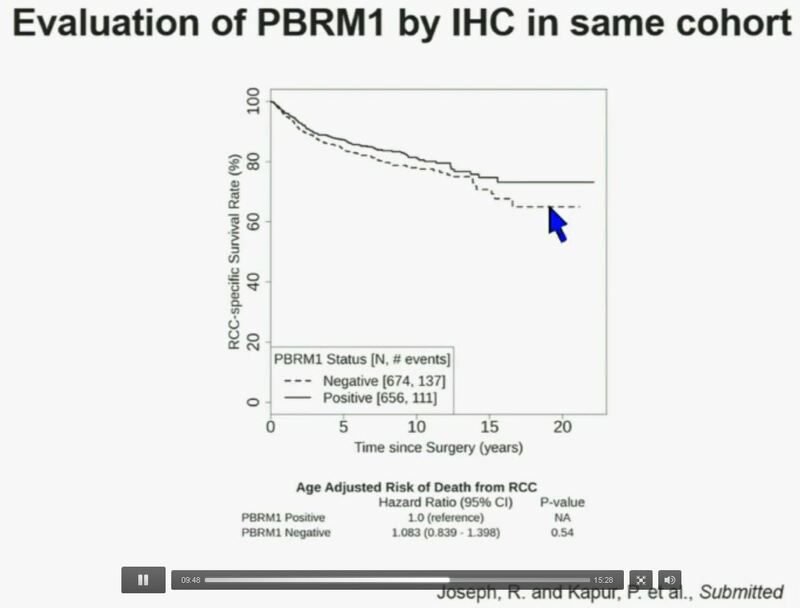 As you can see here (LEFT), we found that patients with PBRM1 deficient tumors had a significant better Overall Survival than those who had BAP1 in their tumors, which had a Hazard Ratio for that of 2.7. We did a similar analysis with the TCGA cohort, and we found (RIGHT)essentially the same result in the same hazard ratio of 2.8, indicating that BAP1 mutant tumors are associated with worse outcomes in patients. This data has now been reproduced by Hakimi and James Ying ?at Memorial Sloan Kettering, as well as the TCGA with their own analysis and our colleagues in Japan and Tim Eisen. 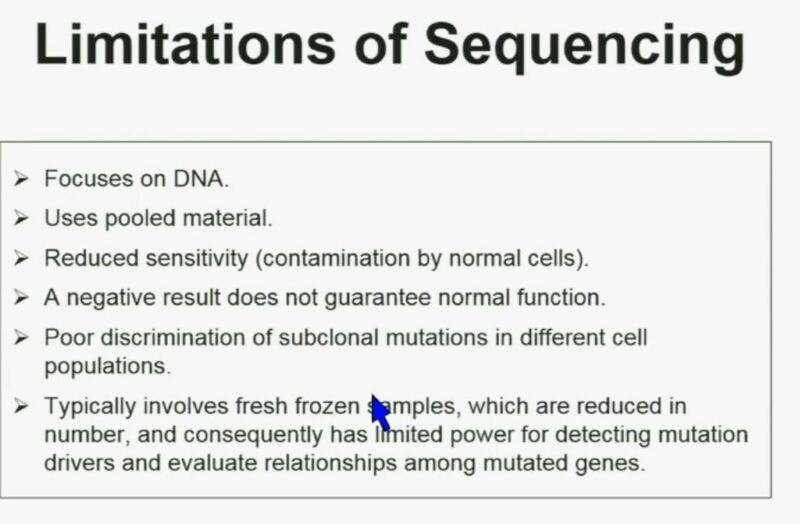 There are some limitations of sequencing. We all like next generation sequencing, but it has some limitations. First, it focuses on DNA. Secondly. it uses pooled material. Thirdly, it has reduced sensitivity which is a consequence of contamination by normal cells. In addition, a negative result does not guarantee that there is normal function. There is poor discrimination of subclonal mutations in different cell populations. So as a consequence of using poor material, we cannot tell whether these mutations are found in the same cells or different cells. Typically, it involves fresh frozen samples which are reduced in numbers, and consequently has limited power for doing some analysis. Interestingly enough, immunohistochemistry (IHC), which we’ve use for a long time is a lot more precise. This is because actually you get information at the cellular level, and you get information about the protein. I mentioned to you that BAP1 is a two-hit tumor suppressor gene, which basically means when it gets mutated, you lose both copies. As you can see here–this is the same series showed before. These are here in blue the tumors that had mutations, in the second column, you can see blue and brown, the results by immunohistochemistry. That is done by IHC. And BAP1 is a nuclear protein, as you can see in these beautiful nuclear staining. The bottom line is the majority of tumors that had mutations (referencing blue column data points) had lost BAP1. There were two tumors with point mutations where we were able to detect the protein. But there were three additional tumors we could not detect protein, but where there was no protein. If there is no protein, there cannot be functioning. The rest of the tumors, with one exception, were all positive. So compared to mutation analysis, in fact, there is positive predictive value is better and the negative predictive value is pretty similar. We have used this immunohistochemisty test in conjunction with the Mayo Clinic, looking at their registry with over 1300 with localized ccRCC. 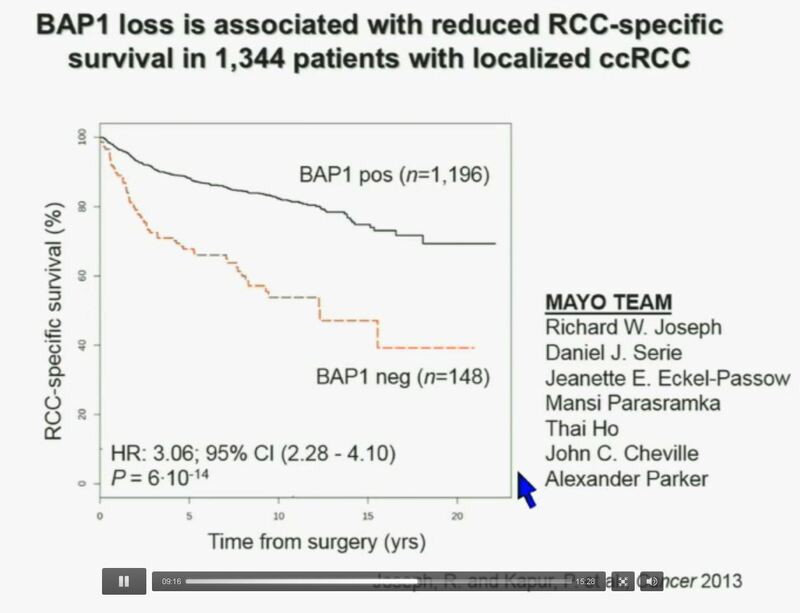 As you can see, looking here with people with specific RCC survival, patients with RCC tumors that have BAP1 positive tumors have significantly better survival outcomes than those who have BAP1 negative tumors, again with a Hazard Ratio of approximately 3. 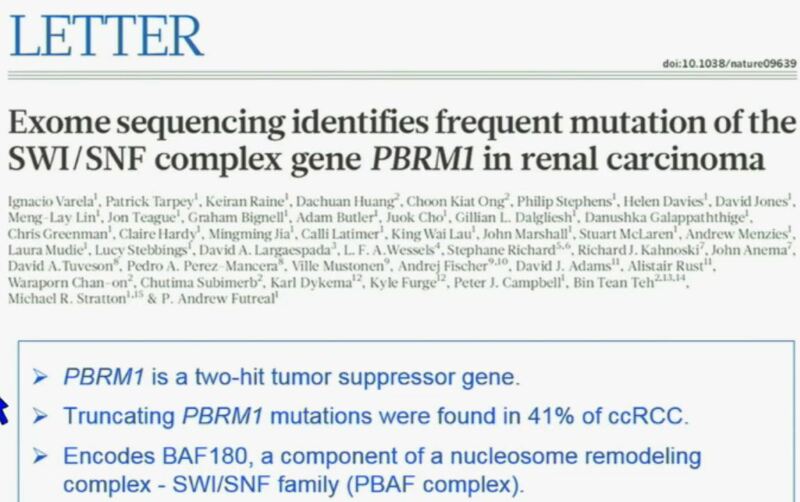 Now in the same cohort we looked at BPRM1, which like BAP1 in a two-hit tumor suppressor gene, and we find no significant differences. 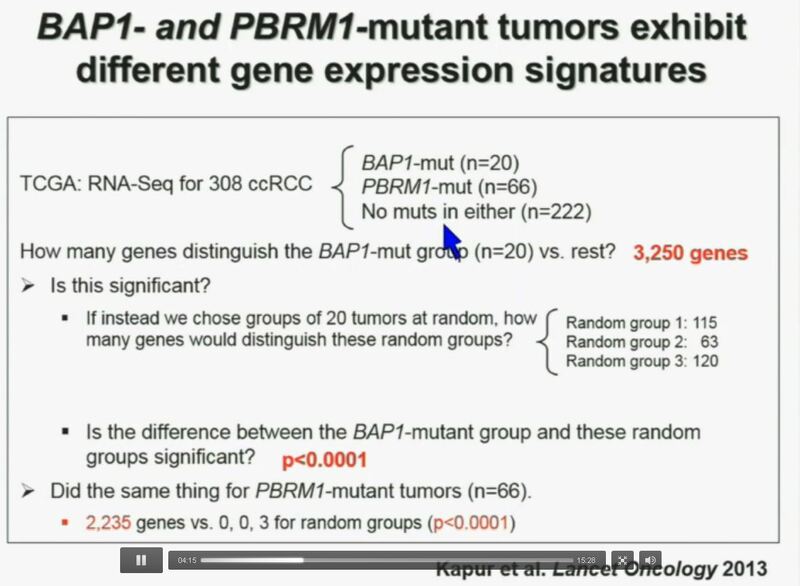 Now in the same cohort we looked at BPRM1, which like BAP1 in a two-hit tumor suppressor gene, and we find no significant differences. I am going to show you look at this tumor over here (upper left path image A) you can see that the tumor cells, there are some that have brown nuclei, but these are the endothelial and the stromal cells (along the edge of the white). 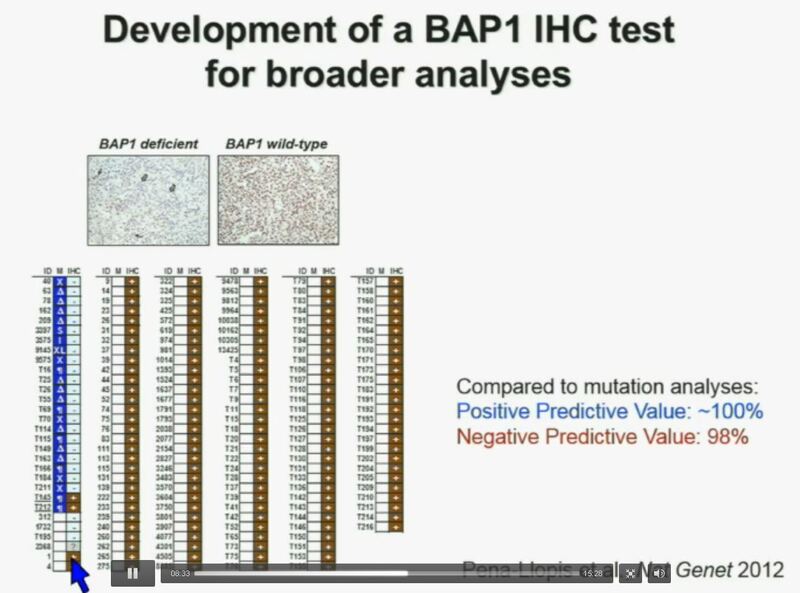 The tumor cells are negative for BAP1. 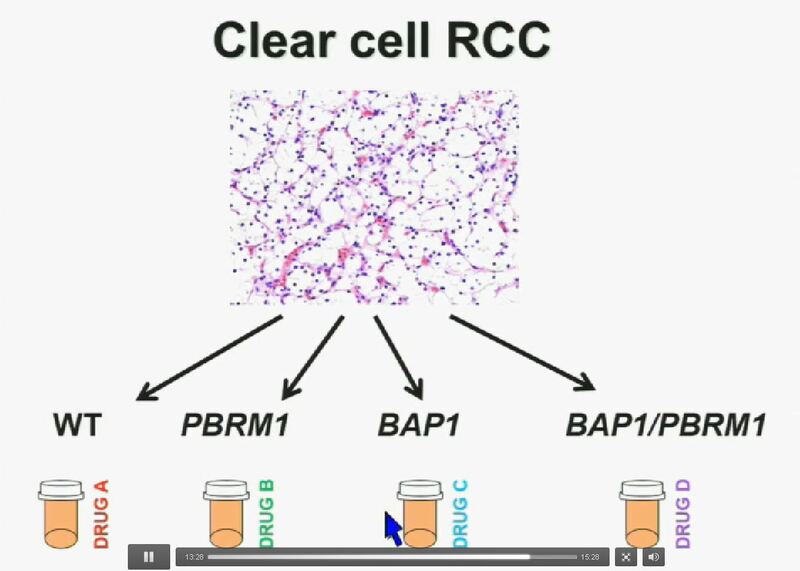 This is the immunohistochemistry (upper right path image B) for PBRM1, where we find the same thing,where the tumor cells are negative for PBRM1. Now (left path image C) compare these tumors with these images below. You can see here that the tumor cells positive for BAP1 in this area (the upper right corner of the path image C) and they are negative (in the lower left corner of Slide C), where you can see specific nuclei which look blue over there. Now if you look at the parallel section (Lower right path slide D) you can see the area that was BAP1 positive (left hand side?? ?D) is actually also PBRM1 negative, and the area which was BAP1 negative is actually PBRM1 positive. So what you have over here (in the upper slides A & B) is a tumor which has lost BAP1 and PBRM1 in the same tumor region, the same cells. The tumor has lost BAP1 and PBRM1 in independent regions. Obviously these tumors will be acting differently and the tumor we are most interested in is this tumor type (in the upper left image A). 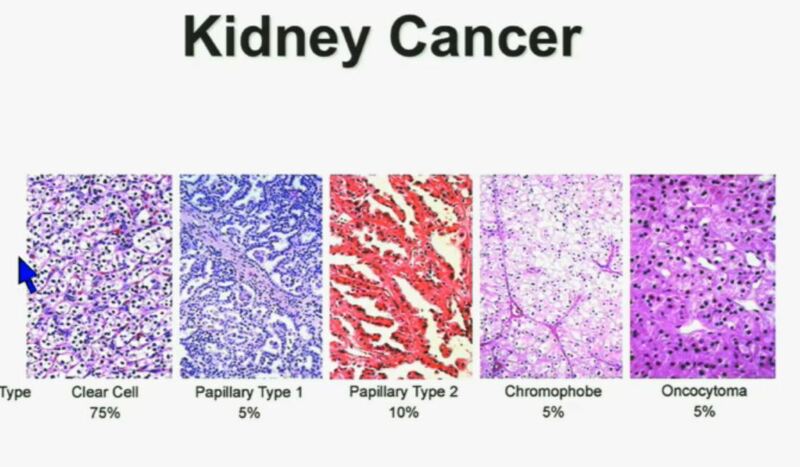 You have seen in our immunohistochemistry test, and we believe we can separate clear cell renal cell carcinoma into four different molecular subtypes. This is looking at Mayo registries, where the patients with best outcomes are those whose tumors are well-typed for PBRM1 and BAP1. Then you have patients that have tumors which are deficient for PBRM1, patients that have tumors that are deficient for BAP1, and patients whose tumors are deficient for both. As you can see the Hazard Ratio is 1.3, 3.2 and 5.2, respectively. As I mentioned to you at the outset, that these tumors were underrepresented and indeed in this very large cohort, we found a very large significant underrepresentation with 1.8% of the tumors being double mutant, compared to 5.3% (which would been expected) with a very highly significant p value, again indicating there is mutual exclusivity–for reasons we do not yet understand. 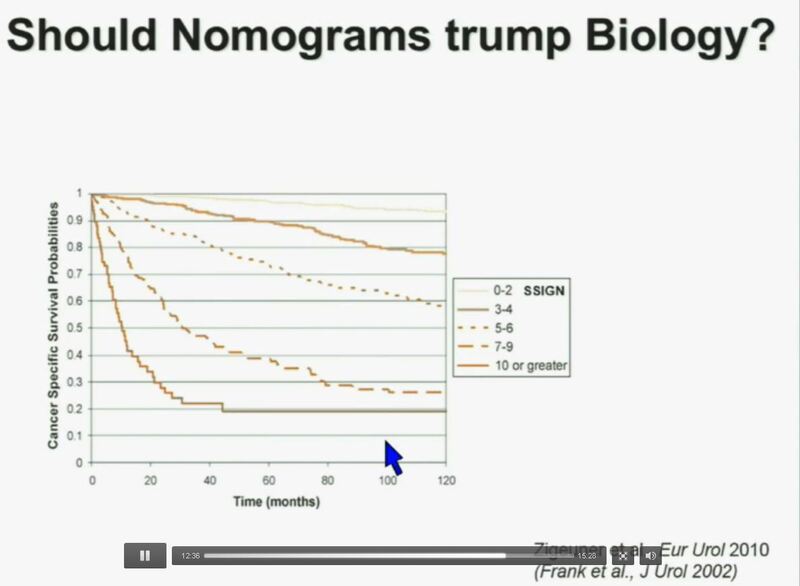 Importantly BAP1 and PBMR1do not predict outcomes independently of SSIGN, which is the nomogram created by the Mayo Clinic, which is based on Stage, SIze, Grade, and Necrosis. This is the SSIGN nomogram; this is the independent validation. You can see the curves separate beautifully, depending upon the score. Now another question I submit to you. 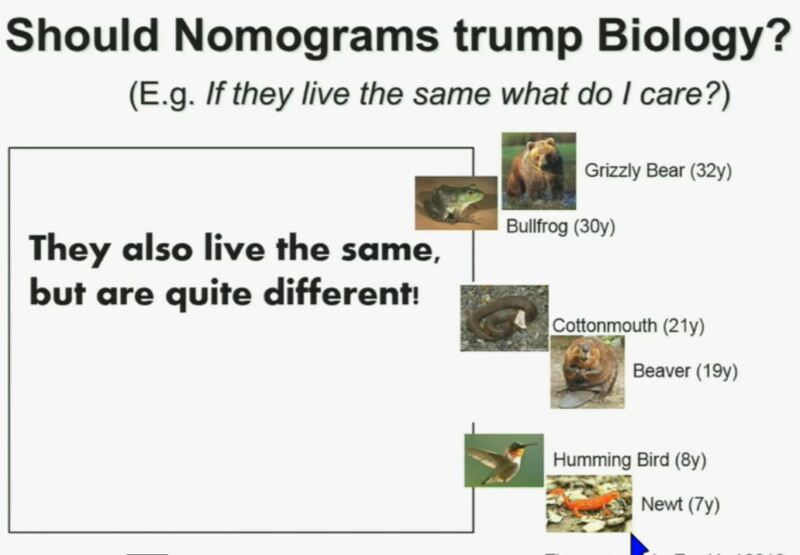 Should nomograms trump biology? In other words, if they live the same, “What do I care?” That has been the traditionally the thinking in the clinic. But look at these animals. A bullfrog and a grizzly bear also live about 30 years. However, they’re very different. The same is true for cottonmouth, a beaver or hummingbird or a newt. So even though they live the same, they are actually quite different! We should be probing deeper and in fact, they should be dealt with differently! 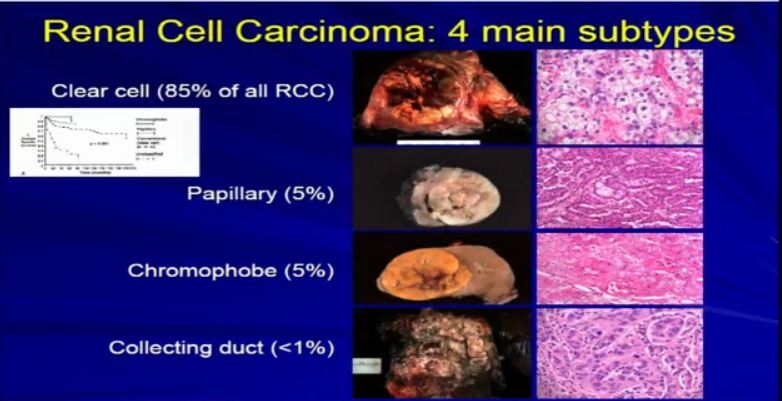 I believe that clear-cell renal cell carcinomas are in fact divided for at least four different subtypes. There are tumors that are wild type for both BAP1 and PBRM1, tumors that are PBRM1 deficient, tumors that are BAP1 deficient, and tumors that are deficient for both. In the future we are going to see different treatments for different tumor types. 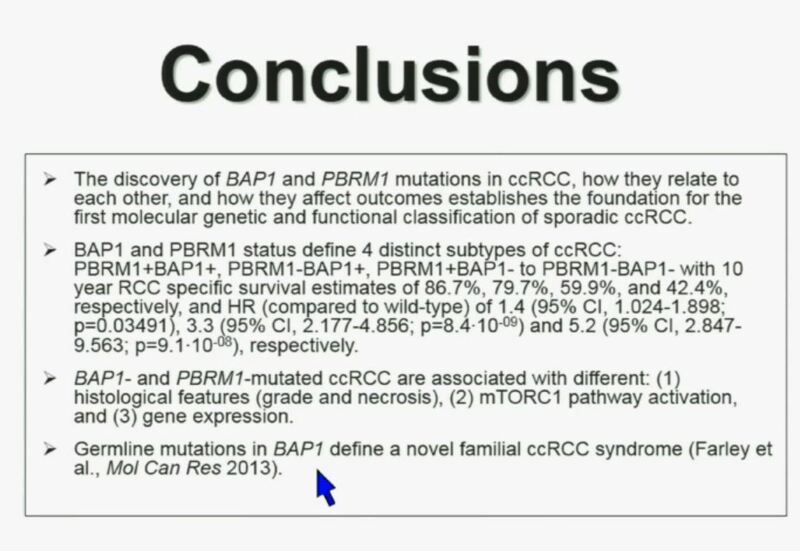 In conclusion, the discovery of BAP1 and PBRM1 mutations in clear cell renal cell carcinoma, how they relate to each other, and how they affect outcomes establishes the foundation for the first molecular and functional classification of sporadic ccRCC. These two genes define for distinct subtypes, which I just went over and you have the Hazard Ratios and p-values written down there. These two tumors are not only associated with different outcomes, but they are also associated with different activations on the mTOR1 pathway and gene expression. 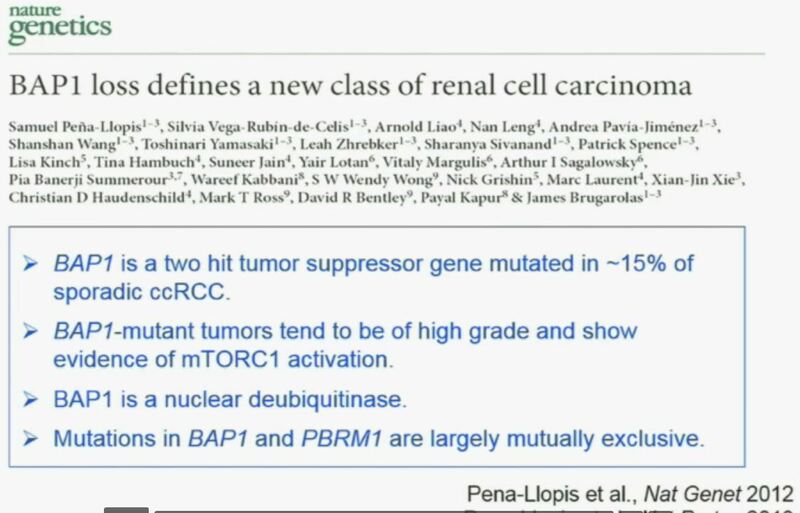 Finally we identify mutations in BAP1 which define a novel clear-cell renal cell carcinoma syndrome. I have forty seconds left! I will go through these very quickly. Suffice it to say, we have also done molecular genetic analysis in non-clear-cell renal cell carcinoma, papillary, chromophobe, oncocytomas, This is now in press in Nature Genetics. We found that papillary clear-cell carcinoma have more mutations than clear cell carcinoma, whereas chromophobe and oncocytomas have significantly lower mutation burdens, which is depicted there. These are some genes we found overrepresented– five seconds! You can see the copy number alterations, gene expressions. Anyway, these papers will be coming out next week. Finally, to acknowledge people who did the work in my laboratory, Pena-Llopis. 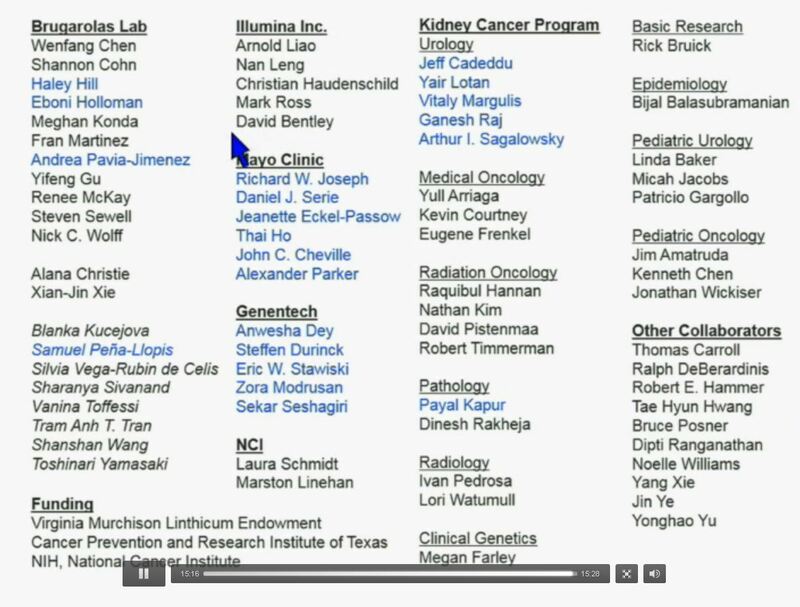 We have had a close collaboration with the people at Mayo Clinic, and also the group at Genentech. We also work very closely with our surgeon and Payal Kapur, our pathologist. Is it a cure or nothing for cancer patients? Is there another way to measure the benefit from any medication? We all want the cure, the Complete Response (CR) that can lasts many months or years. Often we have to settle for some reduction in our tumors or mets, a Partial Response (PR). But even “Stable Disease” is welcome news. To get that cancer back in its cage, even for a time, is better than “Progressive Disease”. When the cancer is progressing, your life may be regressing, and that isn’t what you want to hear. That Progression Free Survival (PFS) has to start with stopping the cancer. As complete and durable (ten years) responder to high dose interleukin 2 (HD IL-2), I welcome any discussions of “Clinical Benefit (CB)”. CB includes all the good responses with any cancer treatment, CRs, PRs, and SDs. We and our doctors need this information to make informed decisions about treatment, for IL2 or other meds. The value of Stable Disease has been ignored in many studies. Maybe there are lessons here for you and your doctors, especially about the under-utilized HD IL2. Clinical benefit (CB) of high-dose interleukin-2 (HD IL-2) in clear cell (cc) metastatic renal cell carcinoma (mRCC). There are few new studies about the use of HD IL2 following the approval of the targeted therapies. The ease of use of these agents, along with the desire not to send patients to specialty centers for IL2, limited its use. It was difficult to select patients, and the CR and PRs were relatively small in number. Doctors often did not discuss the possibility of a cure with their patients. Did patients also miss the chance for Stable Disease, and with it, a “Clinical Benefit”? Patients in this study who did not have a CR, but whose cancer stopped growing benefited. That CB was not counted in terms of the approval of the drug, nor do doctors consider it in their recommendations. Should this possibility be discussed with patients? Most patients would surely answer, “Yes!” to that question. The researchers recognize of the value of Stable Disease (SD) as an outcome, versus only Complete Response (CR) or Partial Response (PR). The usual outcome measures, Progressive Free Survival (PFS), or Overall Survival (OS), are noted, as isTime to Next Treatment (TNT). TNT implicitly recognizes that a failed or limited response will likely be followed by another treatment. Early on, there were no subsequent treatments, sad to say. The original clinical trial which led to FDA approval of HD IL2 recognized only CR, which was 5%, with the median not reached during the trial, and PR, which was 14%. Study footnotes indicate that three of the PRs had surgery which rendered them disease free at the time of the publication. This would now be called a “salvage therapy”, and put them in the No Evidence of Disease (NED) class. A different analysis of this data would have upped the CRs some small percentage, and some SD would also have been found. Also the definition of PR was 50% or greater reduction in measurable tumor size, the sum of the perpendicular diameters of all lesions, with no new increase of size of any other mets. Far less strict measurements of PR were used in the targeted therapy trials, with a 30% tumor reduction defined as a Partial Response. With those definitions in mind, note that there are CRs in 11% of patients, with a PR in an additional 6% of patients. Most important is the SD category, which was achieved for 31% of all patients. This total of 47% is described for the group as being of Clinical Benefit (CB). Certainly patients value the responses of SD, which seems to have provided slightly over one year versus 3-4 months benefit to those who did not have SD. When comparing the value of Objective Response (OR) with its median of 1616 days to that of Stable Disease (SD) measured as 1476 days, one can clearly see the value of achieving Stable Disease. Unfortunately, those patients with Progressive Disease, or with responses Not Evaluable (NE), showed OS of 365 days. Patients should be aware of these definitions and the impact the lack of parallel comparisons in making these critical decisions. Ten years ago, the patients reminded one another to stay alive until the next treatment. Having Stable Disease made that possible. Let’s apply the same tests to all the available treatments when making these life-changing choices of treatment. Background: HD IL-2, an immunotherapy, is a standard of care for a select group of patients (pts) with mRCC. Generally objective response (OR) rates, i.e. complete response (CR) + partial response (PR), of 16-20% are discussed with pts, but not disease stabilization (SD). Recent data suggest that cancer immunotherapy may improve survival without inducing OR. Thus, treatment with HD IL-2 may provide survival benefit to an additional group of pts not experiencing OR, but only SD as the best response. Here we report CB (OR+SD), and specifically report outcomes of cc mRCC pts experiencing SD as the best response, on treatment with HD IL-2. Methods: All sequential cc mRCC pts treated with HD IL-2 at the University of Utah Huntsman Cancer Institute from 2000-2012 were included. Pts were evaluated for best response, progression-free survival (PFS), time to next treatment (TNT) and overall survival (OS). Two practitioners independently reviewed HD IL-2 response with discrepancies adjudicated by a third reviewer. Results: 85 pts, 79% male, were identified with a median age of 56 (range 32-76) years. Pts belonged to the following MSKCC risk categories: 11 (13%) good, 70 (82%) intermediate, and 4 (5%) poor risk. A CR was identified in 9 (11%), PR in 5 (6%), SD in 26 (31%), progressive disease (PD) in 38 (45%), and unknown/not evaluable (NE) in 7 (8%) pts; yielding a clinical benefit in 40 (47%) pts. The median PFS, TNT, and OS in these individual groups of pts are compared in the table. Conclusions: A clinical benefit of HD IL-2 was achieved in nearly half of all clear cell mRCC patients. OS was not significantly different in OR and SD groups. Even though OR favorably determine outcomes, SD is also an important response criterion, and may be discussed during counseling patients for treatment with HD IL-2. Any good radiologist will know that even small primary tumors can have already produced distant mets. That radiologist likely knows that additional imaging should be done in such cases. The GP or even the urologist without RCC experience may NOT know that. Too often small, overlooked mets in the lungs or on a bone can go unnoticed for months or years. Only the radiologist can provide a complete understanding of the extent of the cancer, and only with imaging outside the area of the “incidental finding”. He is the first line of defense, and often the first real expert in determining the extent of the disease. Thanks to those unsung heroes! Durable Response to a Med: Long-lasting or a Hard Time? More Translation Required! When you are suddenly thrust into the medical world, unwillingly and without any kind of road map, you are surrounded by poorly marked turns, meaningless abbreviations and the sudden shift in the dialect. The Wellness Center is usually about having lost one’s “wellness”, a word used only in the medical world, and not by real people. Pressed to make decisions that may change your life, for the better or worse, you can be confused by those clever new words, some from the marketing people (see above) and others from the clinical side. It is critical to understand how familiar words get reworked to explain new concepts. Such explanations rarely reach patients, who are numbed and deafened after a shocking diagnosis. And in the medical “new-speak”, those same patients may be told that this is the time in which they must take charge of their health, and make wise decisions quickly and correctly. I find this a cynical and self-serving approach, as rarely is any real education offered in the language of the patient. For example, we patients think that “progress” is good, but that is not true in cancer. Progression is the goal of the cancer, so Progression Free Survival (PFS) measures the time between treatment and when the cancer is on the visible move again. The word “visible” is important here, as that is a reminder that cancer does not just start at a size or style to match the sensitivity of imaging. X Rays cannot see things as small as a CT scan can. Bone scans see bone mets better than other scans and so on. In reading clinical trials, you will encounter “durable” to explain how long a median PFS can be. It may be described as remarkably durable, but in the pre-patient world, we would think that is pushing into years and years. In reality is may be 15- 18 months. We happily grasp at any more months than the non-treatment reality may be, but be aware of your and your doctor’s expectations in durability. Having a firm grasp of this term and all others is an absolute necessity, and even if that is hard–in the real sense–it will be worth it to you. You will have greater understanding of the treatments, the disease process, and a bit more sense of where you are. More on these topics later, but do track the language, and remember than you still speak the old language. At the very least, be ready to question anything that has that new dialect sound to it! “We Are All Patients.” True or the Latest Cliche? The lovely cliche, “We are all patients” is just that. At every medical conference, or in the new lobby of the hospital, that phrase is offered. While it is true in a statistical sense, it has a snarky sound to the new patient, reeling from his induction into the medical world, foreign and threatening. It can really seem snarky to those who know how poorly patients can be treated, how overwhelming the language of illness is, and how chaotic a hospital setting is for most. The patient experience for someone who speaks the language, whose friend is a specialist, or can understands the imaging reports and lab values, is in stark contrast for those lacking such resources. Not much we-ness in those two patient groups! Certainly the medical people who suddenly become patients, or are thrust into being a caregiver, can offer their own colleagues insight into those new roles. But rarely is the newly diagnosed patient, one who has never “known” how the system works ready to take on this role. He is often the patient at the greatest risk–especially when told, “Be your own best advocate.” Most of the time, that “Be your best” does not give the patient anything, but a reminder of how lost he is. The recent convert to patienthood who can navigate the system may be a wonderful translator of the dialect and the cultural mores of that system, but with limited impact. If that medical pro turned patient is not also willing to change that culture, to be more open, to provide ready access to information, and to teach to the wider world, most patients will not be well-served by this new awareness. As a society, we will continue to be inefficient in our care of the sick, have poorer individual and community health, and waste incredible sums of money. Patients could be given readable information about what the standard of treatment is for their disease. They can learn that the oncoloigst should recommend more frequent imaging, or that there are other treatments than the scalpel and chemotherapy. They can learn how to enhance their daily health, how to monitor side effects, to clarify their own health concerns. Patients can be guided to credible online resources or patient groups so they can ask the new question, compare notes, learn the changing vocabulary. Doctors can tell patients that diagnosis is tricky and requires testing and feedback along the way. They can remind patients of the uncertainty and complexity of cancer, or a chronic disease. They can welcome questions about side effects, new studies, and treatment options. The dynamic will shift as the patient becomes more knowledgeable, or has greater medical needs, and the doctor must shift as well. Patients and their providers need to partner with one another, with the patient at the center of all those relationships. The patient needs ready access to his records, information relevant to his needs, and an atmosphere of collaboration, appropriate to the moment. Anything less is damaging and wasteful, and we ain’t got time and money for business as usual. Pathology and Why It is So Damn Important! 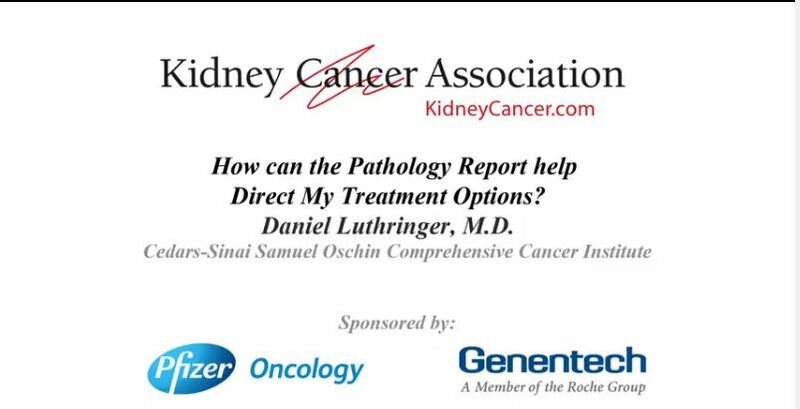 How Does the Pathology Report Help Direct my Treatment Options? I have transcribed the lecture edited for readability, included the slides, to make it easier to follow. If you have not seen your own pathology, GET THAT REPORT now. Important to read! 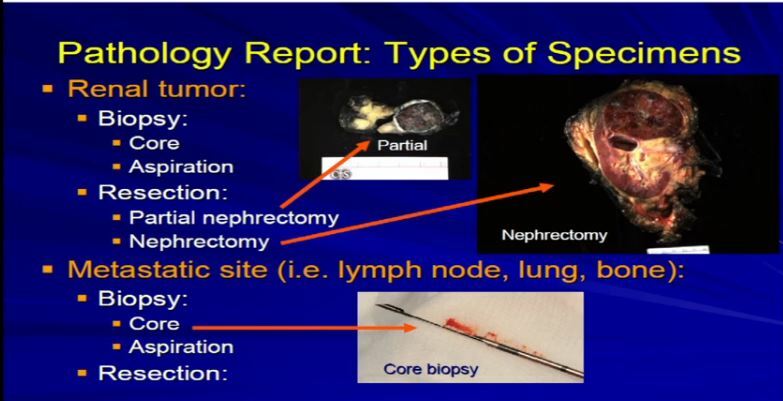 1 There are really two main categories of specimens we receive, samples from the real tumor itself, which can either be biopsies or resections, as Dr. Kim alluded to, or samples from a metastatic site, a recurrence or a metastatic site. The most common specimens that we see are nephrectomies, resections of the tumor, andeither partial nephrectomy or complete nephrectomy. 2 These are examples. A partial nephrectomy, as per Dr. Kim, are smaller resections or partial resections of the entire tumor.They include a bit of nephric fat and a little bit of the perinephretic fat as well. 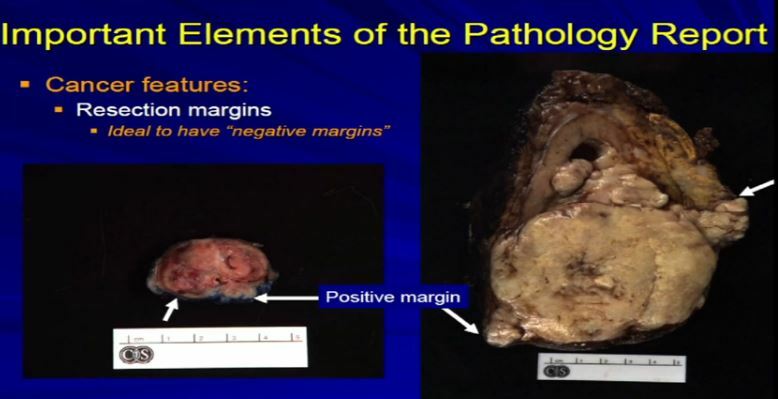 The goal is to get the entire tumor out, with a negative margin of resection. With tumors that are bigger generally, or infiltrative, we tend to get the entire kidney. This is an example of a nephrectomy with perinephric fat, the sinus fat, drainage area down here, maybe an adrenal gland up top and this would be an example of tumor that is completely resected. Occasionally we will get tumors from metastatic sites or—unusually from the primary tumor—and will get a core biopsy, which is really a small smaller sample of the tumor mass. Usually it is about a millimeter or two in diameter; it’s a core, maybe up to several millimeters up to a centimeter in length. Generally, it is just a small sample of a much larger tumor . 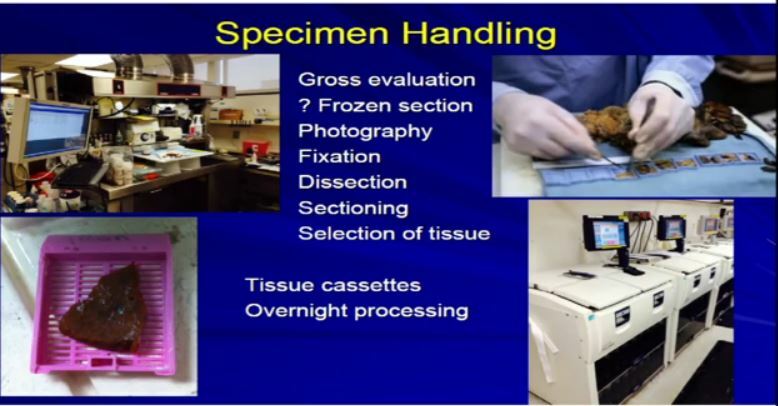 3 A bit about the specimen handling: within a few minutes of having the tissue removed, it comes to the pathology lab. We do some initial assessment on it. We have work stations where they will come and the pathology team will assess it. Assume it is a nephrology specimen. We look at it and measure it, cut it open, procure some of the tissue. If there is some tissue that needs to be taken fresh, potentially for a biobank to be stored away, or if some tissue needs to be taken for immediate diagnosis or margins or something like that, we will do that. If you’re enrolled in a study where there some fresh tissue is needed, sent to a particular institution or a reference laboratory for an analysis, we will procure that as well and make arrangements to send it off on an immediate basis. At that point we do photography, tissue fixation and over the next few hours we will dissect the specimen, will analyze it, do a lot important evaluation with our eyes and ears, whatever it takes. Then we will take what are called representative sections of that tumor or specimen, put them. We put them into these little capsules called cassettes and then we process them overnight in these tissue processors. These are pretty standard from institution to institution. 3a The next morning the tissue is taken out of the processors and is manually placed in these other tissue cassettes which are filled with paraffin wax essentially. They are embedded into these wax molds, and then the blocks. Then very thin sections of 4 to 5 microns are cut with these special microtomes and they are picked up on the glass slides. They are again processed, stained, and cover slipped. Ultimately we get a sample of glass slides from that tumor that has been removed. On an average partial or complete nephrectomy, we will go anywhere from 5-10 paraffin blocks, equating to 5 -10 glass slides. This takes about a day or two to complete this. 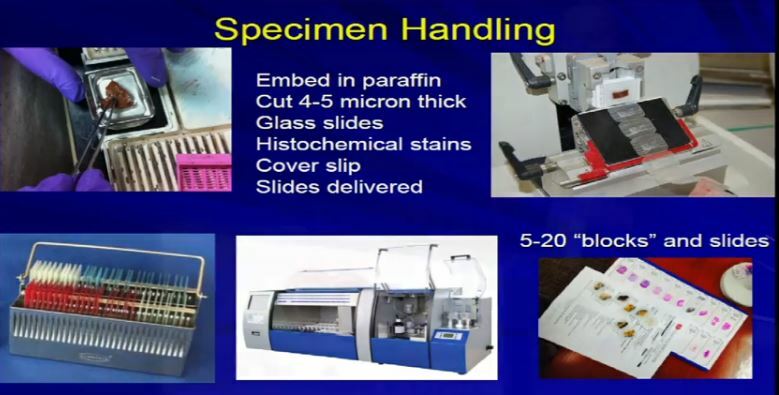 Then the initial slides are delivered to the pathologist, who will begin the process of microscopic analysis. He uses obviously his microscope and whatever tools he needs. He’ll be looking at those sections from the slides, and it will usually be the sections from the kidney, maybe some lymph nodes, margins, adrenal glands, things that were provided by the surgical resection. The whole process usually takes 2-3 days to complete. There is a bit of a time lag, due to the technical processing involved. 4a The Elements of the Report. Once we generate the report, and it becomes available, there are really three categories of information that are really relevant– not just the diagnosis, but the future care of the patient. The first is the diagnosis. What is the diagnosis? Is it really renal cell carcinoma or is it some other unusual type of renal cell cancer? I will talk more about that. 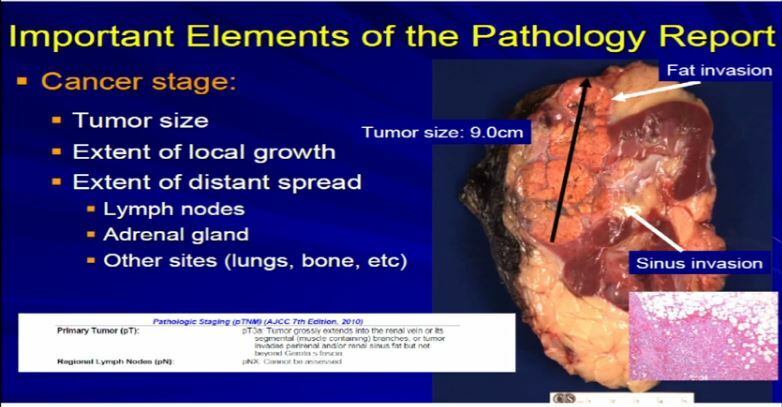 Then: aspects related to cancer stage–tumor size, local infiltration. Has it metastasized or spread? Last, the other features that Dr. Kim alluded to in his talk—resection margins, grade, vascular invasions. We will talk to about these just briefly. 4bThe first aspect is diagnosis. 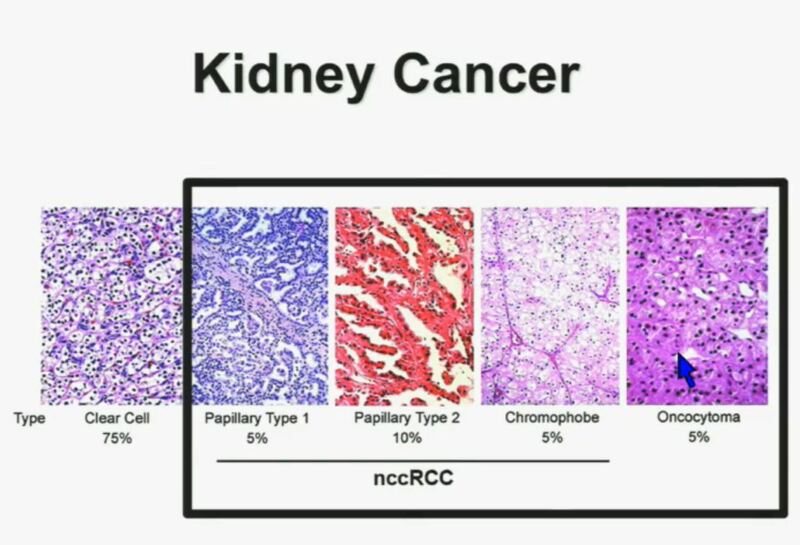 The important thing to remember, and \I think everyone in the room is a little bit beyond this, but remember that at the initial phase, tumors are resected and often times it is not know if it is a RCC. Often times it isn’t even know if it is a neoplasm at all. Not all tumor masses are neoplastic or malignancies. There are other types of tumors besides kRCCs. Angiomylipomas are a very common tumor. They could be very big like this one. Here’s a kidney. Here’s a big one. They could be multiple. Here’d two. They could be small one or 2 cm like this, but they all look like fatty tumors, but not all RCCs. Different types of tumor like fibroma or oncocytoma can be very big and aggressive-looking, but in fact, they’re not malignant at all. 6 There are other types of malignancies, true malignancies of the kidney which are not real carcinomas. Urothelial tumors, those that are derived from the lining of the kidney that can extend into the kidney, be derived of the kidney. These are examples of some of these here. They were resected, thinking that these are probably RCCs, but in fact they turned to be urothelial, not RCCs. Different types of tumors like sarcoma can be derived of the kidney or around the kidney. Other types of tumors can metastasize to the kidney or near the kidney. 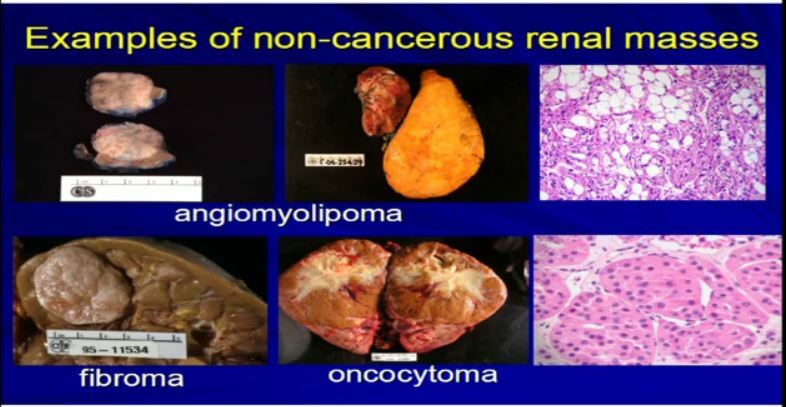 Adrenal tumors, lymphomas—there is a whole host of malignancies which can mimic RCC. 7 What were really talking about today here obviously is renal cell carcinomas which represent probably 90% of more of all true malignancies of the kidney. These are the tumors which are derived from the renal tubular epithelian cells, those little ducts that line the epithelium of the kidney. The diagnosis of RCC really is contingent upon microscopic analysis. You can’t make the diagnosis any other way. 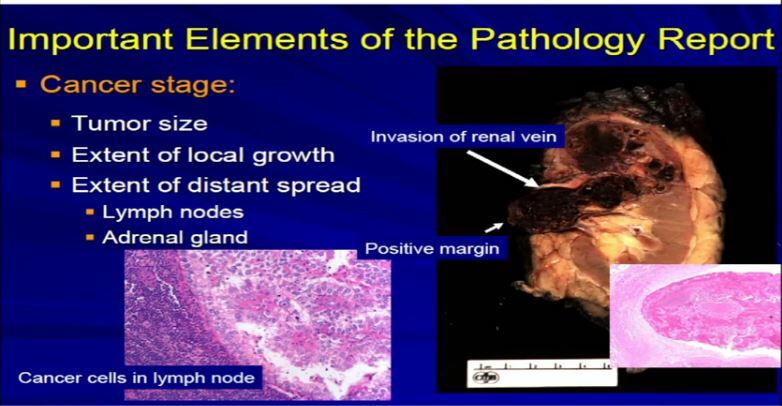 The pathologist needs to look at the gross, take a section, look under the microscopic, and then there’s a spectrum, a range of features that will ensure the diagnosis or put it into a diagnostic category of RCC. Sometimes is not so simple. 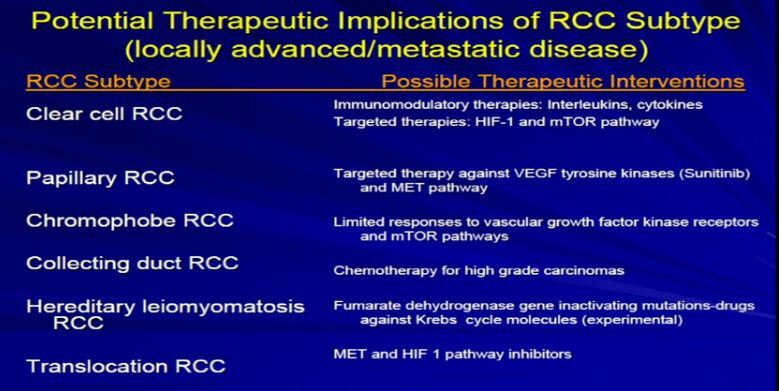 We need special testing–the use of antibodies, immunohistochemical studies or even as Dr. Young Kim alluded to, sometimes we need to refer to some molecular analysis to put it into a diagnostic category of RCC. 7a Once we’ve done that, the next phrase is to determine the subtype. There are many different subtypes of RCCs really based primarily on the appearance of the tumor cells and their architectural growth patterns. Sometimes they can rely on immunohistochemical, some of the molecular properties or genetic profiles that put it in the proper subtype category. 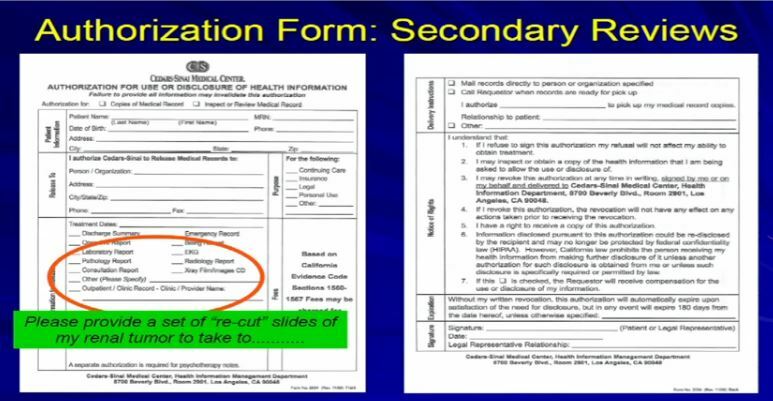 Now the subclassification of RCCs and probably this is familiar. You’re familiar with RCCs and it is not so simple. It’s an evolving, sort of complex and ever-changing categorization. In fact, the overall categorization of subtypes just changed a few months ago. 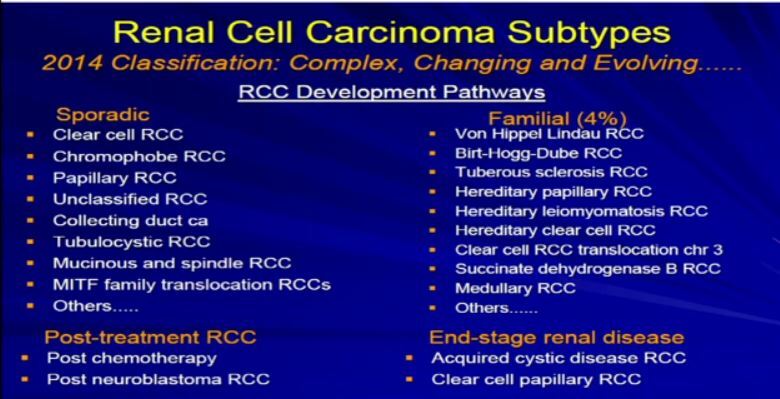 We like to think about RCC and subtypes in a sort of developmental pathway. There is a sporadic type– that which just happened to occur–which is probably the type of cancer that most people in this room happen to have. Those are our typical clear cell, chromophobe, papillary renal cell carcinomas or maybe a few of the other rare variants. There are those which tend to be familiar; these represent 90+ percent of all RCCs. The familial patterns–again what is associated—they are pretty rare. They are associated with and in families, multiple tumors. Different family members can have these, and we will talk a little bit more about these. There is actually going to be a talk about later in the afternoon or the morning about genetic-based or familial-based RCCs. There are those rare—really associated with treatment of other types of cancers, and there is unusual category when you have scarred or damaged kidneys. Those kidneys are at risk for developing RCC. Let’s move through this little bit. 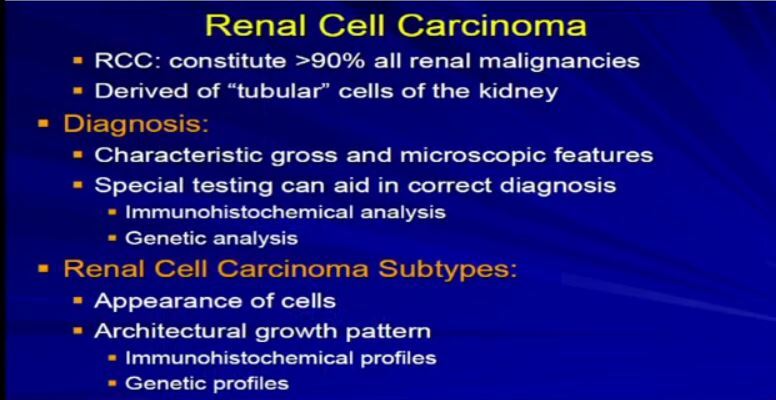 Once we have made the diagnosis of RCC, we’ve sub categorized it. I know it seems complex, but there are really only three or four main subtypes that we really need to talk about, especially in the context of a setting like this. 8 The most common subtype is the clear cell type. 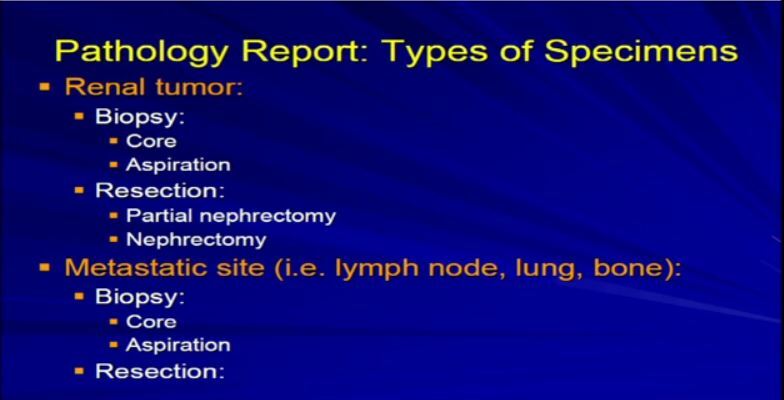 This represents about the vast majority of all sporadic types of renal cell carcinoma. Then there are the papillary and chromophobe renal cell carcinomas. Since these are really the usual types. The much less common type is collecting duct carcinoma which is really more like a urothelial cancer, it behaves like a urothelial cancer, it’s a more aggressive type of RCC. These are really the main four that we need to be concerned about. They are each unique based on their gross appearance and these are all partial nephrectomies (this is complete down here). Look at their gross appearance. They are very unique under the microscope. Look at their microscopic appearance. The clear cell is clear, the papillary, very architectural pattern of a papillary tumor. These are chromophobe. This unusual eosinophilic cytoplasm are the tumor cells. Probably doesn’t mean a lot to you, but it means a lot to us, also to some other clinicians. So they have very characteristic gross, microscopic and they are very unique biochemical—and as Dr. Kim alluded to—very specific molecular and genetic profiles as well. This is all really evolving as we speak. And we all know—this is small graph—that these also behave differently, Some behave better than others, so it is really important that we subclassify these RCCs based on their appearance—all the appearances that we talked about. 9 The other thing that Dr. Kim alluded to, and I think we are going to talk about this a little later, and I won’t get into detail on this, but just to point out that the sub-classifications, the sub-categories, they respond differently to the different armamentaria that we have in terms of treatment modalities. 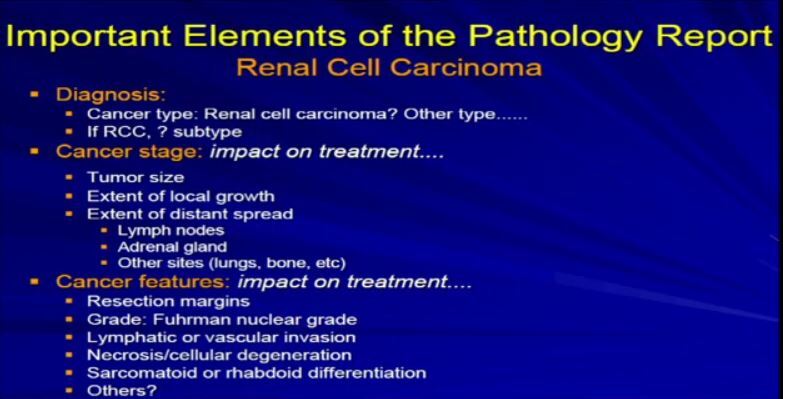 So it’s very important for the pathologist to sub classify the type of RCC. 10 So on any standard pathology report, you are going to see the diagnosis, RCC, then the subtype, buried somewhere in the report; It will say, clear cell type, papillary type, chromophobe. That’s a very important part of the report. 11 After diagnosis, the next important aspect is the cancer stage; The cancer stage is really defined by the size of the tumor and its local growth. Is it extending, is it staying confined to the kidney, outside the kidney to the local fat, is it going into any regional lymph nodes that might have been removed during surgery, or was it extending into the adrenal gland, which might have been removed as well? So we analyze each case on what we have and what we see. This is a typical example of a partial nephrectomy specimen of clear cell carcinoma with a margin that’s out here. Here it measures about 2.1 centimeters the margin is negative. This is a very small tumor of clear cell RCC. This would stage out at T1a, pretty low stage tumor. This would have a pretty good prognosis based on that staging profile. 12 Now compare that with this tumor which is a complete nephrectomy specimen, shown the kidney, a lot of nephritic fat. Here’s the sinus of the kidney and here’s the tumor out here. Much bigger, about 9 centimeters and it is growing into the fat. It’s growing into the sinus fat; it is demonstrating more aggressive local growth. This would stage out—this is a microscopic showing it extending into fat. We would stage this out at T3a tumor, as it is obviously larger and more infiltrative. 13 A different example would be the same thing. A RCC clear cell type; this is a full nephrectomy specimen. Here’s the kidney. Notice that the tumor is extending into the renal vein. This is another feature that we analyze and look for. We look for it grossly and microscopically and look for tumor extension into that vein, because that will upstage the tumor, overall tumor stage, and this is associated with generally adverse outcome. It is telling us this tumor is behaving more aggressively with local growth. We might see a lymph node, with metastatic clear cell RCC. Again, another aspect we would examine grossly and microscopically. 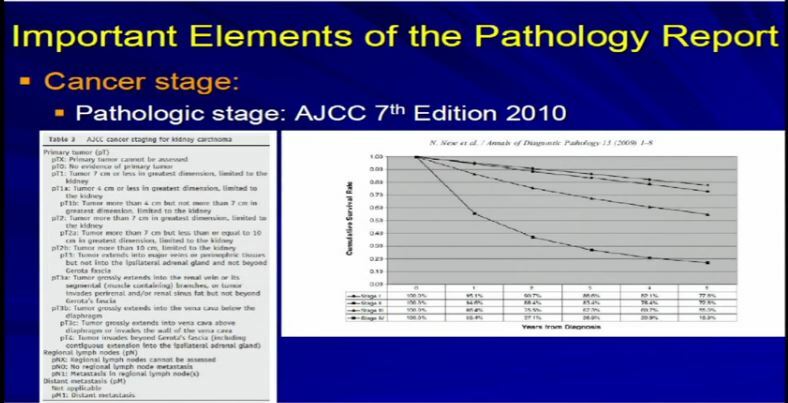 15 So we take all these features, once we have analyzed the tumor and we apply the grading system created by the Joint Council on Cancer Staging, the AJCC and we apply the pathologic stage. Why? Because as Dr. Kim alluded to, we all know, that cancer staging, and it is true for any type of cancer, the higher the stage, the more aggressive that tumor will likely behave therefore the therapy needs to be tailored to their particular stage. And the report should indicate clearly dictate the tumor stage. And that’s part of the standard reporting. Any good cancer report. 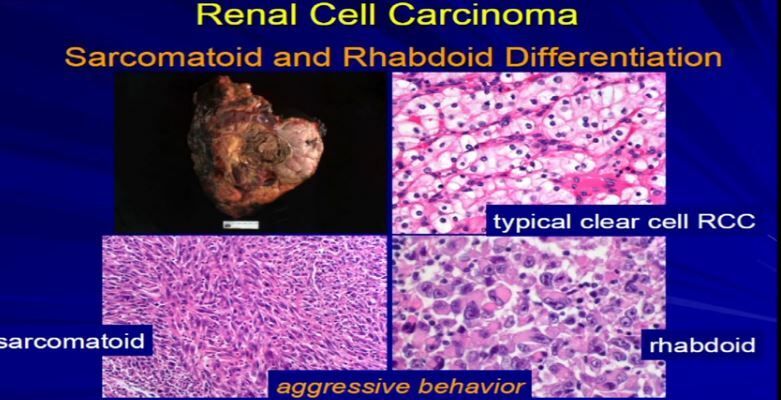 14 The final cancer features I’m going to talk about we’re talking about are; resection margin, the grade, vascular invasion, tumor necrosis and this this unusual rhabdoid or sarcomatoid differentiation. These are elements which go beyond cancer staging and the diagnosis. Here’s two examples. 16 Let us talk about resection margins. These are indirectly related to or they indicate the local aggressiveness of a tumor, if they are growing to a margin. It’s ideal when a partial nephrectomy or a complete nephrectomy is performed, as we have here, the surgeons always try to get the whole thing out so we achieve negative margins . That is optimal. Sometimes it’s not possible, especially if we have a high stage RCC like this one which is extending into fat. Sometimes it’s impossible to get a clear margin. This might get portend some additional therapy when it comes to therapeutic– time for a therapy . With a smaller resection sometimes it’s impossible to get a negative margin or the surgeon needs to go back and take cleaner margins. That interpreted for frozen section analysis, and clear out that margin, again because optimally, we want to achieve a negative resection margin. 17 The next factor is vascular invasion. When the tumor invades into those lymphatics that Dr. Kim talked about in surgery. They have a propensity for them to go to the lymph node or they can go into veins or even sometimes arteries and then they have unfortunately, the capacity to go to the lungs or bones or other sites. Those confer an adverse prognostic indicator. Those are an indicator that this tumor might behave in a more aggressive manner. So if we see it microscopically, we include it in the report. Also if there’s tumor cell degeneration and necrosis, that is usually associated aggressive growth in the tumor and we will report that, too. Sometimes that will dictate how the next round of therapy will be undertaken. 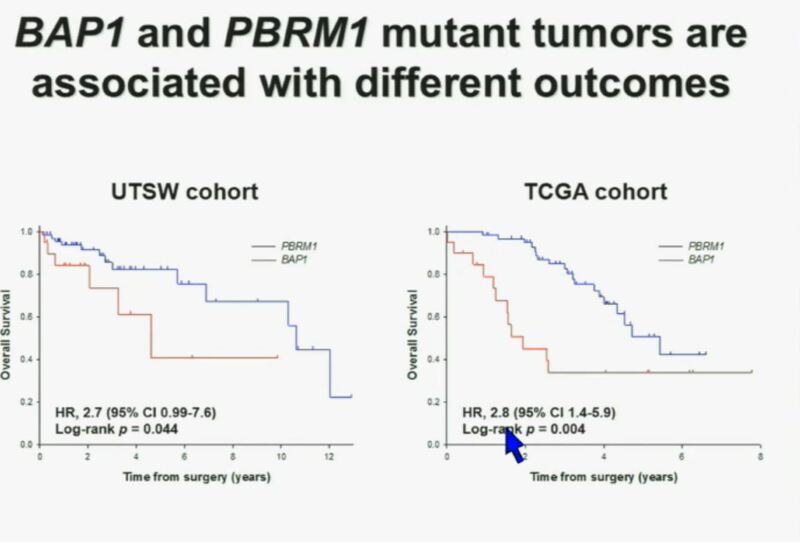 18 Dr. Kim already talked about tumor grade. 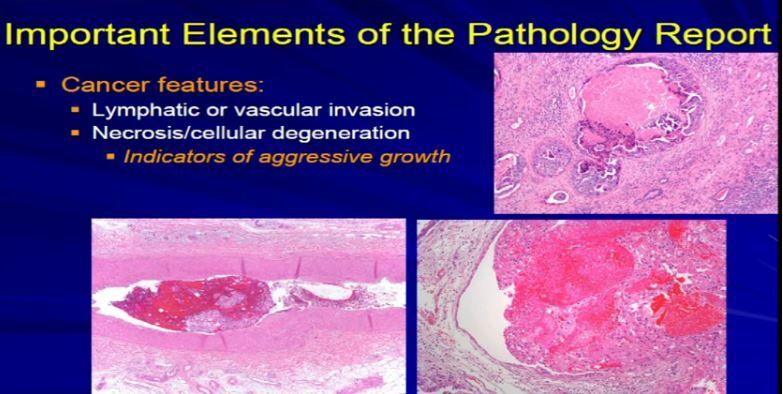 We apply–the pathologist applies the tumor grade. The Fuhrman grade is the one that is used for RCC, and it a grading system for 1 to 4. Really, it delineates the degree of differentiation. 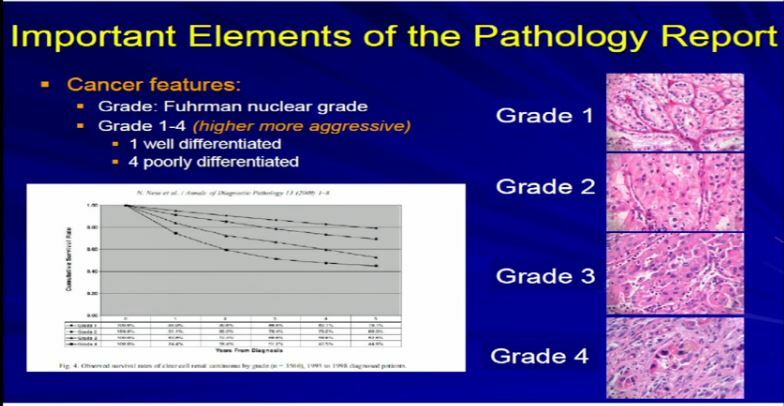 Grade 1s are well-differentiated tumor, grade 4 are poorly differentiated and in any type of tumor–doesn’t matter if it’s breast, color, renal cell carcinoma–generally well-differentiated tumors behave better than poorly-differentiated tumors.And we assign a grade based on our observations. 20 Two quick categories and I will be done here.I was say a couple of words about hereditary genetic syndromes associated with RCC. This is taken out there that long list that \I presented a few slides back. We all know that there are well-known, well-defined syndromes–genetic syndromes or familial syndromes that put you at increased risk from dying from other neoplasms, including RCC, notably Von Hippel Lindau, tuberous sclerosis, Birt-Hogg Dube, these sorts of things. The bottom line: as a pathologist, I can’t look at most of these tumors and say, “this is a clear cell carcinoma. It’s clearly Von Hippel-Lindau, tubersclerosis, or whatever.” All I can say is that it is clear cell carcinoma. 21 There are a few types of tumors that I can look at and say, if they have unusual morphology, like this tumor up here, or this tumor up here (references images) , they don’t comfortably fit into the typical types of RCC. Maybe it is a syndromic-type of carcinoma. Very, very rare, less than one percent that we would ever suggest to a clinician that maybe this is syndromic. What we can do is when we get samples like a renal resection like these three different cases, where there are multiple tumors. Here we have multiple tumors or multiple cysts—here we have maybe 20 or 30 different tumors in the particular kidney—or here’s a younger patient with one, two, three separate tumors. Then we can suggest that there is something odd about this, as we usually don’t see this in sporadic type tumors. Maybe it is associated with a genetic syndrome. 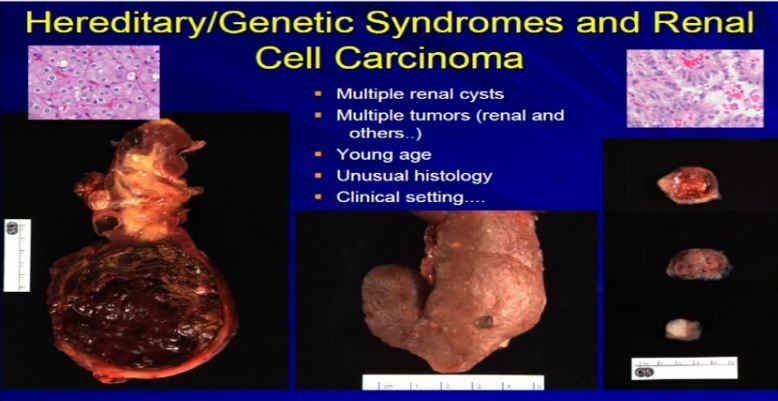 So; multiple tumors, cysts, a young age, presentation of a renal cell carcinoma of unusual histology, we will suggest to your treatment team that maybe this is a genetic or syndromic pattern of RCC. There’s going to be more on this topic later this morning. 22 The final topic I was asked to talk about the performance of secondary slide reviews. It’s kind of important. It’s really important when you come to an institution for definitive therapy, it’s always good to have that team—and we do this all the time—review the outside slides to be sure that you have an expert team who works with your treating physicians. We work as a team through tumor board reviews and discussions, and almost every discussions–. Almost every single individual case, to ensure that we have the correct diagnosis. We have the critical elements included in that report. The specific special testings have been performed, and we have accurate diagnosis and staging and things like that. What you need to do is provide, when you come here, is a copy of the reports, a set of the glass slides, sometimes we call them the recuts. That is all we need to provide an incoming secondary review. The other scenario when you go off, you might need to off somewhere else for some additional testing for some additional therapy. In that situation, you might need to take, or you should take a set of slides with you to that institution because they will probably want to the same thing and review to ensure that we are all talking about the same disease process. Remember that your slides or blocks, when you are treated here, or whatever institution, generally those tissue blocks are stored in an incredible huge file, either in the basement of the hospital right below us here or in a warehouse as we have done down in Torrance. T. They are basically saved forever. So when you need to go somewhere in five or ten or fifteen or twenty years, God forbid that there is a recurrence, and you need to get some additional testing, we can pull those blocks out from Torrance (CA) and create a second set of recuts, or a third or fourth set. We can send it off wherever it needs to go for some additional testing or evaluation. With that Dr. Luthringer thanks the KCA, the audience and Dr. Figlin for the chance to speak. 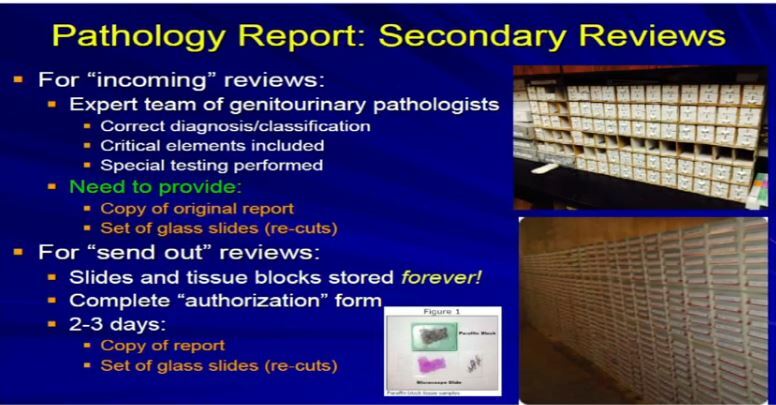 And with that, I agree remind you to get a copy of your own pathology report, and know where your slides are stored. If there is any questions as to your own pathology, if the tumor seems to be unusual, or of an especially high grade, do yourself and your family a big favor, and discuss whether a review of your slides is in order! With this rare disease, and the complexity of doing the kind of analysis you see here, do not be afraid to get that second opinion. Go back and see so that pathology may affect the treatment options given–very important!